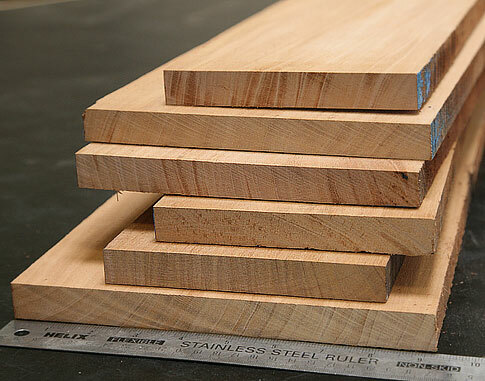 Details in our blog: "What Does 4/4 Mean in Lumber?" 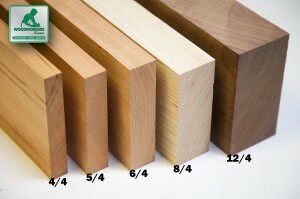 This is the range of widths that are usually available in this wood. Price shown is for a random selection of widths within this range. Request special width selection using the "Minimum Size Request" box in the order form. We're easy to buy from! That means we can cut you a short piece(s) from long boards if you want. The actual footage you're going to receive is most likely going to change slightly from what you order. This is because we'll be hand selecting your lumber from inventory of various widths and lengths. Usually the change is just a small percentage. This calculator figures the board footage for an exact size. Be the king of carving with basswood! It's soft and formable, largely free of defects with a creamy white to yellow color. 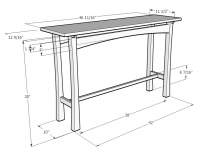 The thickness of hardwood lumber is expressed as a fraction in quarters of an inch. 4/4 is the most common. It means approximately 1" thick. Our blog explains more. Click here. Basswood Furniture Squares: 1-3/4" x 1-3/4" x 30"
Basswood is the wood of choice for many wood carvers. This light weight wood works very easily with both hand and power tools. It cuts cleanly, nails, screws, and glues well, though sanding leaves the surface woolly. Can be painted, stained, and finished without difficulty. Creamy white to very light brown. They didn't have what I was looking for but contacted me and we came up with a solution that was perfect. I couldn't be happier with the piece they picked out for me, especially since my project requires such detail, I needed them to really look over the piece and they did just that! This will be my ONLY source for wood if I cannot pick the piece locally. Delivered a high quality product in very usable lengths. The basswood sheet was exactly what I needed. Precisely as anticipated. No surprises. Great wood, fast service. Happy camper.